Normandy in France is easily accessible from the UK and is well worth exploring by motorbike. There are ferry ports at Cherbourg, Caen, Dieppe and Le Havre. Whether you’re riding along dramatic coastal roads or through rolling countryside, there are plenty of towns and villages worth stopping off at. Perhaps you’ll take in the D-Day Beaches or head inland to admire charming rural communes with their ancient half-timbered buildings? French roads are quieter than in many parts of the UK, so you’ll often enjoy solitude while riding. Speed limits are 30 km/h to 50km/h in towns, occasionally 70km/h through quiet communes or past junctions, 80 km/h on single carriageways (90 km/h on some 2-lane sections), and 130 km/h on motorways (theoretically 110 km/h in the rain). In France, motorists are usually forewarned of speed cameras by signs, but it’s still possible to pick up speeding tickets from mobile cameras. As well, Normandy was the first French region to adopt privatised speed cameras in unmarked cars. Regarding motorbike gear, French law demands that you wear CE-approved motorcycle gloves and carry a hi-viz jacket. You must put this jacket on if you break down on your bike in a vulnerable place. There are many directions you might take in Normandy, and there are places worth seeing in all directions. Below are just some of them. 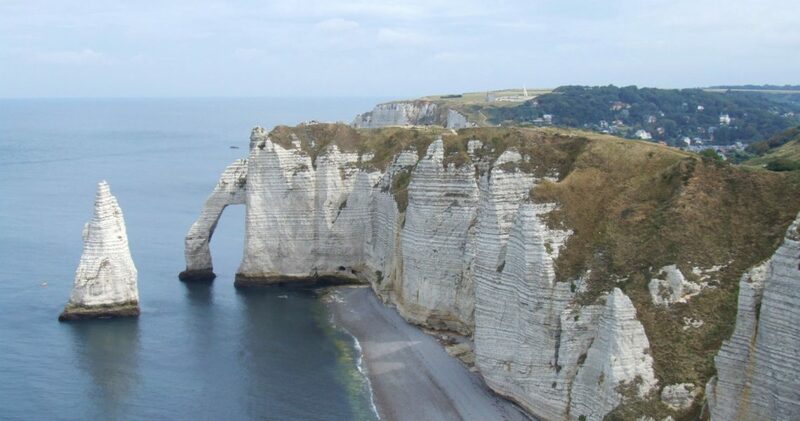 Often painted by Monet and other artists, Étretat is particularly well-known for its striking arched rock formation. This coastal town is best accessed from Le Havre, and the ride there is pretty rural; it’s not accessible by motorway. Once there, you can chill out and relax on the beach or walk up onto the clifftop for dramatic views. Further up the coast is Fécamp, which is also worth a visit. You can ride easily to Honfleur from Caen, and it’s a classic journey. It’s also close to Le Havre, separated by the spectacular Pont de Normandie (Normandy Bridge). One of the most picturesque ports in Normandy, Honfleur is popular among bikers and travellers in general. The old harbour (Vieux Bassin) is one of its most attractive features, but some of the best restaurants lie along the back roads. Giverny is so far inland that it’s almost in the Île-de-France, but it’s a must-see for art or garden lovers (or both). Monet lived in the village for many years, and you can visit his house and garden. The nearby Museum of Impressionism is also worth visiting. Just across the River Seine is Vernon, where accommodation is more likely to be found and cheaper. Vernon was one of the last communes to be liberated during the WW2 Battle of Normandy in late August 1944. 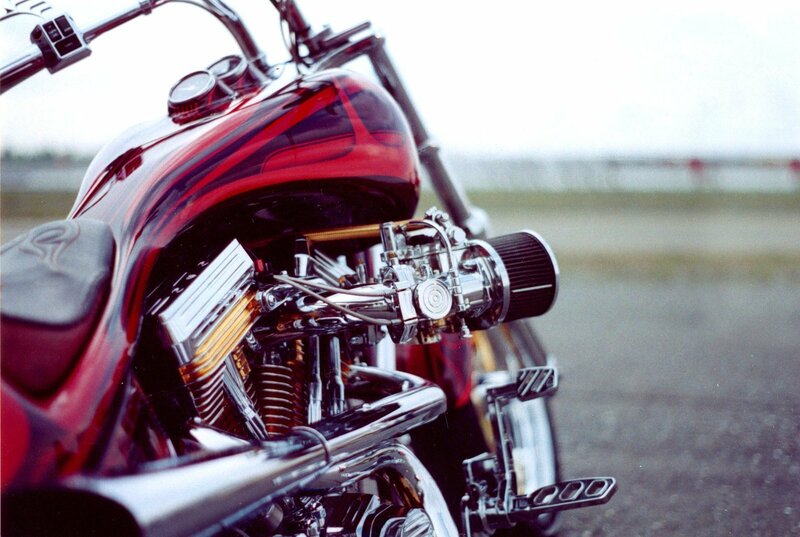 Bikers interested in WW2 history can visit many notable sites along the Normandy coast. Among them are Pegasus Bridge, the Atlantic Wall Museum at Ouistreham, Arromanches (site of the artificial port and the D-Day Museum), Omaha Beach and the American Cemetery, Pointe du Hoc (preserved battlefield on clifftop), Sainte-Mère-Église and the La Cambe German Military Cemetery.